Sweetheart galloped along the road. Her hooves pounded in a rhythmic beat, her mane and tail streaming out behind her like a pale banner in the wind. Her breathing became labored as I crouched over her but still she kept on running, never wanting to stop. I was flying and I closed my eyes as she galloped on. The scenery passed by in a blur and ecstasy filled me as we became one. This was life. Sweetheart slowed and I let her alone, a silent being melted into her heart. She slowed to walk and finally I opened my eyes. I looked into her large brown eyes, the color of chocolate, and saw love radiating in them. I pressed my cheek against hers and held her gaze, knowing that true love and mutual respect was wavering back and forth between us. Sweetheart was mine, and I hers, forever. thanks sydney! please critique this everyone! its not my fave work but it just popped into my head. 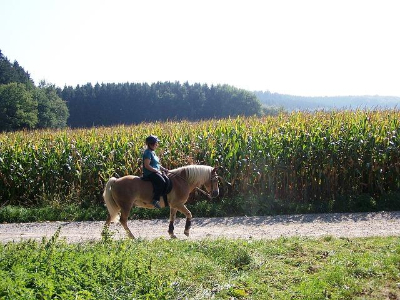 i don't have a horse of my own however i may be getting a mini named Sadie soon!<3 go HOrses! I hope you will write more! Your style is melodic.